Trim a tree, save a life. Biologists working in Mali are proposing an unorthodox strategy to rein in malaria: gardening. The team found the flowers of an invasive tree, which has overrun African villages, can double as a buffet for mosquitoes. Their calls for extra horticulture to eliminate these havens, published Tuesday in Malaria Journal, could halve malaria-carrying mosquito populations and provide a new income source for villagers. Villages with the invasive flowering tree had four- to seven times more sugar-fed mosquitoes than villages without the tree. Malaria, a parasite transmitted by female Anopheles mosquitoes, infects up to 300 million people each year. Toddlers are particularly susceptible to the disease, with more than two-thirds of malaria deaths occurring in those under the age of five. The World Health Organization lists mosquito control as the best way to prevent the disease. But malaria-carrying mosquitoes feed on more than just blood — and this hunger can be exploited. “Mosquitos obtain most of their energy needs from plant sugars taken from the nectar of flowers,” Gunter Muller, a biologist from Hebrew University Hadassah Medical School said in a press release. 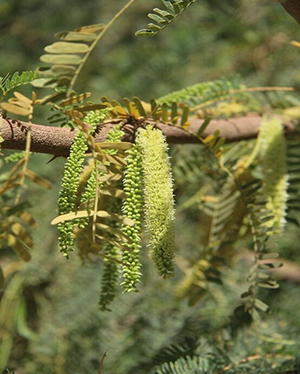 Muller’s team knew a spiny, invasive mesquite tree — Prosopis juliflora — flourishes in Mali villages. Its flowers provide abundant sweet nectar to insects, particularly during the dry season when native trees are not in bloom. Introduced to the area 30 years ago from Central and South America to reduce deforestation and provide construction materials and firewood, Prosopis juliflora became rampant in its new environment. Now, it overtakes crop and pastureland, prompting villagers to abandon their fields. Muller suspected more nectar means more and longer-living mosquitoes, but, no one had checked for sure. Could cutting off the mosquitoes’ non-blood food supply curb the bugs? So, Muller’s team took a head count. The scientists trapped mosquitoes in nine villages in central Mali every night for close to a week. They compared average mosquito population numbers and the sugar content in the mosquitoes’ guts from villages with and without the invasive tree. Villages with the invasive flowering tree had four- to seven times more sugar-fed mosquitoes than villages without the tree. The risk for catching malaria increases in places with older female mosquitoes, so the researchers evaluated the ages of the bugs they caught. Villages with the flowering invasive plant had about six times more of these older females than villages without the tree. 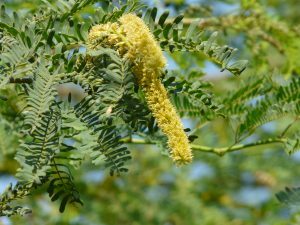 “By introducing mesquite trees in these areas, [humans] may have inadvertently and massively increased the potential mosquito risk,” Karl Malamud-Roam, manager of Interregional Research 4, a public health pesticide program, and ecologist at Rutgers University, who was not involved in the study, said. Without the flowers, the Anopheles mosquito population dropped by nearly 60 percent. After this initial mosquito population survey, the team cut the flowering branches from the trees in three of the villages and made a re-count. Without the flowers, the Anopheles mosquito population dropped by nearly 60 percent. Male mosquitoes took a particular punch in the gut. While the female mosquito population bombed by five-fold, the male mosquito population plummeted by eight-fold. The older female mosquitoes were also hard hit, dropping by three-fold. Removing this sugary food source may not only shift areas from high- to low-risk malaria status, but could also recover agricultural and pasture lands the invasive tree had taken over. Malamud-Roam said questions remain about the full scope of this tactic. There are limited resources for mosquito control, and a large-scale effort to remove Prosopis juliflora trees would require a lot of money and people power. Plus, “there are two proven tools with large-scale acceptance in malaria control– treated nets and indoor residual spray,” Malamud-Roam said.